A pair of wide leg cropped jeans has been on my to-do list for a while, and finally I can tick that box. Well almost – my original plan was to give this denim a distressed finish, but that goes against my gut instinct to attack these with sandpaper and stuff when I spent so much of my weekend making them! I based the pattern on these trousers, adding more flare and cropping them to get the desired silhouette. Then it was simply a matter of adding all the details – fly front, patch pockets, waistband. The initial plan was for back welt pockets but I soon back pedalled on that idea due to the distressing idea. In the end I couldn’t decide, and before I knew it the trousers were made with no back pockets at all! I topstitched the darts to give some back detail though. The size has turned out a little large, about half a size. I am hoping that they will shrink in a good hot wash! Cutting was an absolute breeze though! I work a lot with flimsy fabrics, so to lay up and mark this denim only felt like it took a couple of minutes in comparison. All seams were sewn on my industrial machine, and topstitching was done on my Pfaff Passport 3. The last time I topstitched with heavyweight thread on my industrial I had some tension problems (it does need a service…) and I have to say my baby Pfaff handled it very well. I used a heavyweight thread for topstitching (Amann Saba Nr 30, Col 1120) with my usual thread in the bobbin (Amann Saba Nr 120), and loosened the top tension a couple of notches. My machine sewed all that topstitching very nicely except a small blip at the CB waistband – if I had my own labels I could cover it up! In a couple of instances where I backtacked the top thread pulled to the back a bit and caused a mini birds nest, but otherwise I was very happy with the way the Pfaff Passport handled things – it had such great piercing power through the thicker denim layers, and handled the bumpy ups and downs of varying thicknesses really well. The first test buttonhole went really well, but there were a couple of buttonholes where the cycle did not complete. I think the buttonhole foot got caught on the different layers of the fly? Not sure really (I’m a buttonhole newbie on domestic machines) but at least with heavyweight thread they were easy to rip out and re-do. One is still a little wonky but the button covers it well, so don’t tell anyone OK?! The buttons were sourced from Geoff’s Emporium. I already had some for another project and knew they were The Ones! But when I got there I could not find them, or anything else suitable and I was just about to give up after a panicked five minutes of looking when I spotted them. Hiding. Right in front of my nose all the time! I also bought a few other things of course. If you’ve ever been to Geoff’s you will understand that this is a natural occurrence ;). So that is my ‘jeans’ in their original state. I think I will wear them like this for a while and when the gloss of all that work topstitching wears off I will be ready to attack them with grit and chemicals. What do you think – all shiny and new, or shipwrecked? Just last night I searched everywhere for a sailor pants pattern. In high school I wanted a pair so bad! I ended up buying Style Arcs sailor pant pattern that I’ll need to do some adjusting to and Simplicity 8391 which I’ll make higher waisted. I’m plus size now but I think I still deserve a pair! I love everything about yours here and on your other post! Far out! Love these! And I’d definitely leave them as is, I think normal wear looks much better than fake/distressed. They will get that worn look after a while anyway! Keep these beauties as is and make a 2nd pair that you can destress with your chemicals. I can see you making these in different colors, too! WOW! Just WOW! Oh my goodness…these are amazing! I love them all shiny and new. I once made a pair of distressed Ginger jeans and I distressed the fabric before sewing. I really don’t think I could have done it after, LOL. I don’t regret the decision, but I agree with the comments suggesting let the distressing happen naturally. Your top stitching is really, really, awesome too. And I love how you did the front pockets. I have the Gaston Pantalons and can see myself doing a more sailor version. Just wonderful as they are.I love all the detailing. May I ask, do you have a link to how you do your perfect welt pockets…..swoon worthy! Another vote for letting them distress naturally, these are superbly made, so why risk spoiling them? Your work is amazing – those welt pockets and all the detailing!! Love the pants too. All that beautiful topstitching and the details in the pockets and the button fly!!! Wonderful pair of cropped jeans. Wow that topstitching! Beautiful. And of course. The Pockets! I say let alone and let them age naturally, but totally your choice. A note about the buttonholes. My Pfaff did this too–it didn’t matter how heavy or lightweight or stabilized the fabric. I solved this by fixing up my old singer with the old school buttonhole attachment. Not ideal, but it worked. Anyway, all that to say, I think that is just the nature of the Pfaff. Marvelous, ditto on everyone else’s comments! I wonder if my Janome HD can handle all that topstitching…. so worth it! Ditto on everyone’s comments, they look fabulous and leave them to distress naturally. Wonderful jeans!! I totally agree with the majority that distress should be natural. I love them. I love the top stitching colour. I just saw someone walking through town today with wide leg jeans but full length and I like yours much better, maybe because I lived through the wide, wide flares in the late 70’s. I love Centrepoint Fabrics and just made a dress with some fabric my son chose a few years ago there, and Geoff’s Emporium was such fun shopping in. They always had the little thing you didn’t know you wanted but had to have when you saw it! What great details you have added and your top stitching is absolutely stunning! Beautiful topstitching is my sewing nemesis! I have to second everyone else and say keep them as they are and let them age on their own… it would be a shame to do anything that detracts from your design lines and topstitching. Once again, great job and thanks for all the ways your sewing inspires me to try new things! I better get wearing them then! 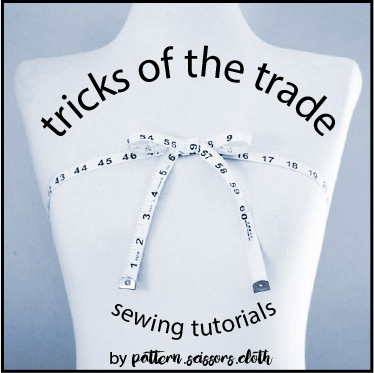 Thanks for the tip on the buttonholes, I never thought to use ordinary thread! They’re beautiful -leave them as they are! I like them as-is. & I’m living for those pockets! I LOVE THESE! Every detail is perfect! Absolutely perfect! If I saw these in the shops, I would immediately snap me up a few pairs. I absolutely agree with the comment above. Great addition to the wardrobe.